The concepts presented in this section are integrated into the framework and tools presented in this guidance. They are fundamental to understanding the logic used in the development of the tools and key to appropriate application of this guidance. The remainder of this guidance assumes the reader is familiar with these key concepts and has a level of knowledge commensurate with the content of the ITRC’s LNAPL Internet-Based Training (IBT) courses. The training courses are available online (www.clu-in.org/live/archive) at no cost. Understanding of LNAPL releases, the behavior of LNAPL in the subsurface, and the methods used to evaluate LNAPL releases have evolved significantly in recent years. Unfortunately, misconceptions derived from our early, less-informed understanding of LNAPL releases are frequently encountered. Table 3-1 outlines common misconceptions relating to LNAPL releases and the associated current understanding and key concepts which are discussed in detail in referenced sections of the document. A glossary of familiar LNAPL related terms is presented at the end of this document (Glossary). LNAPL enters soil pores just as easily as groundwater (Section 3.2). LNAPL floats on the water table or capillary fringe like a pancake and does not penetrate below the water table (Section 3.2). Typically, water is the wetting fluid in the saturated zone, in direct contact with the soil, and occupies the smaller pores. LNAPL must displace the water (and gases) within a pore space before it can migrate. For this to occur, it must have a driving head and overcome the capillary pressure exerted by the water in the pore. LNAPL does not float on the water table in a uniform, high-saturation, “pancake”-like layer. The LNAPL is distributed above, at, and below the water table at saturations that vary vertically depending on past conditions such as LNAPL driving head and water table fluctuations. If there is no LNAPL visible in a well, then there is no LNAPL present (Section 3.4). If LNAPL in soil adjacent to the well is below residual saturation, then LNAPL will not appear in the well, although the presence of a sheen is possible. Persistent measurable dissolved- and/or vapor-phase petroleum hydrocarbon concentrations are indicative of the presence of LNAPL at or below residual saturation in the saturated and/or vadose zone. Risk assessment should not be conducted if LNAPL is present in a well (Section 3.5). Risks posed by mobile or residual LNAPL can be assessed using generally-accepted risk characterization and assessment practices (including Risk-Based Corrective Action). A mobile LNAPL that is migrating laterally may pose different risks than the same LNAPL at residual saturation within the same plume. LNAPL thicknesses in monitoring wells are equal to the LNAPL thicknesses in the formation (Section 3.4). For unconfined LNAPL in a uniform geology at a location not significantly affected by water-table fluctuation, the thickness of LNAPL in the well will be similar to the thickness of the mobile LNAPL interval in the adjacent formation. For LNAPL under confined or perched conditions, the LNAPL thickness in the adjacent well will likely be exaggerated. For the same LNAPL in-well thickness, the volume of LNAPL per unit footprint area of the formation (LNAPL specific volume) can be different for different wells. The LNAPL specific volume is generally higher in coarse-grained soils than in fine-grained soils. Due to the dependence of in-well LNAPL thickness on geology and variable groundwater hydraulics, it should not generally be used as a sole metric for recoverability and indication of migration. All soil pores in an LNAPL body are completely filled with LNAPL (Section 3.2). You can hydraulically recover all of the LNAPL from the subsurface (Section 3.6). The presence of LNAPL in a monitoring well indicates proximal presence of LNAPL above residual saturation. Soil pores are never 100% filled with LNAPL due to the concurrent presence of other fluids such as water and gases. The LNAPL saturation depends on the geology, LNAPL fluid properties, and release dynamics. LNAPL cannot be completely removed from soil by hydraulic recovery due to mechanical limitations in subsurface soils. The lowest saturation theoretically attainable by hydraulic recovery is residual saturation, and that is rarely achieved. If you see LNAPL in a monitoring well, then it is migrating (Sections 3.2 and 3.4). LNAPL bodies spread due to groundwater flow (Section 3.2). LNAPL bodies continue to move long after the release is stopped (Section 3.5). The presence of LNAPL in a well is an indication that the LNAPL adjacent to the well exceeds residual saturation and is mobile. The LNAPL has the ability to flow into the “large” pore which is the well. However, mobility of the LNAPL into the well does not imply migration of the LNAPL body within the (much smaller) pore space of the adjacent soil. LNAPL is considered migrating when it is observed to expand into previously unimpacted locations over time (i.e., in-well LNAPL appears in a monitoring well that had an initially clean borehole). 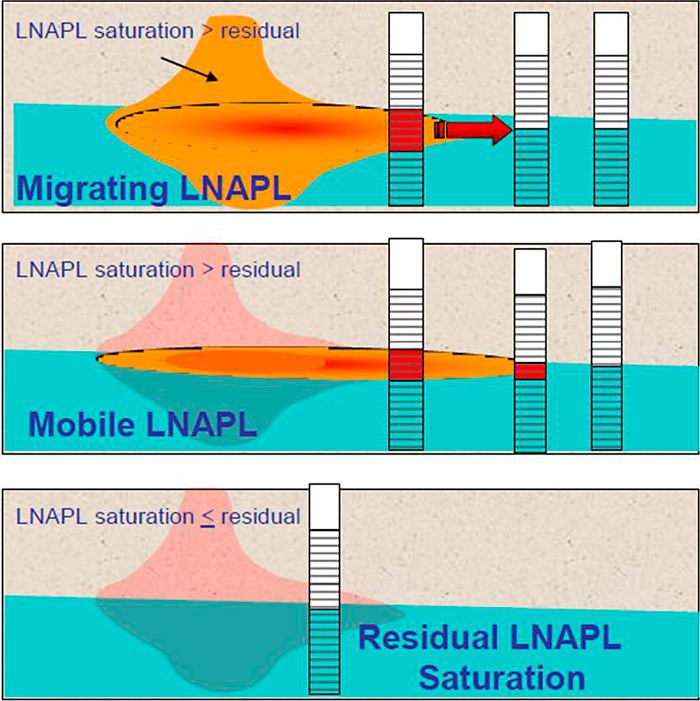 Migration of LNAPL cannot occur unless LNAPL is present above residual and within the mobile range of LNAPL saturations. LNAPL bodies associated with a terminated or finite source (i.e., UST removal or a pipeline leak repaired) eventually stop migrating within a relatively short timeframe as the driving head dissipates. Not all mobile LNAPL migrates, but LNAPL must be mobile in order to migrate. Multiple lines of evidence may be needed to make the distinction between mobile and migrating LNAPL. Reduction of LNAPL saturation to the residual range is not necessary to arrest LNAPL migration. If you see LNAPL in a monitoring well, then it is mobile and migrating (Section 3.5). LNAPL is considered mobile when it accumulates in a well (assuming the well is properly constructed and screened across the LNAPL smear zone). LNAPL is mobile when it is present at a saturation greater than residual. Mobile LNAPL is potentially hydraulically recoverable, but recoverability depends on various physical factors. LNAPL presence in a well does not necessarily mean that the LNAPL body is migrating. Residual saturation is easily determined (Section 3.5). 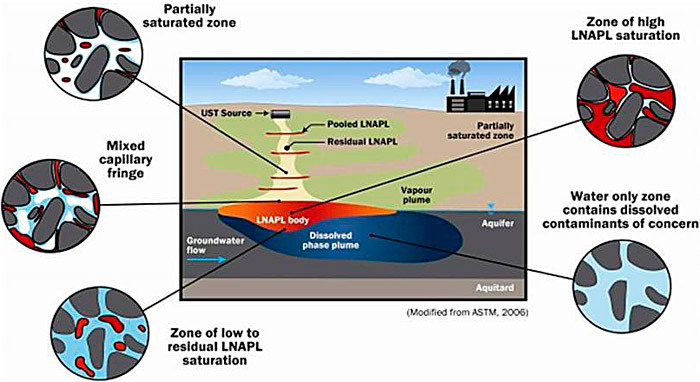 Residual LNAPL saturation is different for the saturated and unsaturated zones due to the variable presence of other fluids such as water and gases. Typically, unsaturated (vadose) zone residual saturation is generally lower. Water table fluctuations (e.g., seasonal or tidal) result in a dynamic change in the extent of the unsaturated and saturated zones, causing the LNAPL to continuously redistribute vertically. Consequently the amount of mobile LNAPL changes with time, while the total LNAPL volume remains unchanged. Residual LNAPL saturation is not a single number, rather a range of saturations. Hydraulic recovery of LNAPL reduces associated dissolved phase plume concentrations (Section 3.6). Most types of petroleum hydrocarbon LNAPL are a multi-constituent mixture (e.g., gasoline, diesel), the exception being single-constituent LNAPL (e.g., benzene). Constituent concentrations in groundwater and/or vapor depend primarily on LNAPL composition (i.e., mole fractions of the individual constituents in the LNAPL and their pure phase solubility). They have limited dependence on LNAPL saturation. Therefore, rarely does hydraulic recovery reduce dissolved phase concentrations. There is no definition of evaluating “LNAPL removal to the maximum extent practicable” or recoverability (Section 3.6). LNAPL transmissivity is a reliable indicator of the ability of the formation to transmit LNAPL to a well. LNAPL transmissivity depends on soil type, LNAPL type, LNAPL saturation, and thickness of mobile LNAPL. Since LNAPL transmissivity is related to all key variables (see above) that can affect recoverability, it is a better metric than the conventionally used metric of in-well LNAPL thickness. The higher the LNAPL transmissivity, the higher the LNAPL recoverability. Any LNAPL remediation technology can address all remediation objectives (Sections 3.2 and 3.6). Saturation reduction technologies (e.g., mass recovery) are best suited to abating LNAPL body migration and can shorten dissolved plume longevity. Composition change technologies (e.g., phase change) are best suited to address remediation objectives of reducing constituent concentrations in groundwater and vapor. Where mobile LNAPL is present, but LNAPL migration is not a concern, evaluate LNAPL saturation reduction in terms of added net benefit. The following subsections discuss the key concepts associated with the initial formation of the LNAPL body from a release, its subsurface distribution, and changes that it undergoes over time. When an LNAPL release occurs, the LNAPL will move vertically downward under the influence of gravity through the permeable pathways (e.g., unconsolidated soil, fractures, and macropores) and, if sufficient LNAPL volume and head is generated by the release, the LNAPL will eventually encounter the water table. During the downward movement of LNAPL through the soil, the presence of confining layers, subsurface heterogeneities, or other preferential pathways may result in irregular and complex lateral spreading and/or perching of LNAPL before the water table is encountered. Once at the water table, the LNAPL will spread laterally in a radial fashion as well as penetrate vertically downward into the saturated zone, displacing water to some depth proportional to the driving force of the vertical LNAPL column (or LNAPL head). The vertical penetration of LNAPL into the saturated zone will continue to occur as long as the downward force produced by the LNAPL head or pressure from the LNAPL release exceeds the counteracting forces produced by the resistance of the soil matrix and the buoyancy resulting from the density difference between LNAPL and groundwater. Once the release of LNAPL is terminated, the areal extent of the LNAPL body will continue to expand for a relatively short time, and eventually stop once the resistive forces in the soil balance the driving force of the diminishing LNAPL head. When the LNAPL body reaches this state, the LNAPL body has stabilized in extent, and will not typically expand further unless additional releases or significant subsurface hydraulic changes occur. Conceptual depictions of an LNAPL release and the initial stabilization of an LNAPL body are provided in Figure 3-1. Section 4 of this document discusses the development of an LCSM that incorporates a release history and summary of processes that create the observed LNAPL distribution in the subsurface. Figure 3-1. Time lapse conceptualization of LNAPL body formation (Courtesy of Matthew Rousseau/GHD). A typical LNAPL body consists of LNAPL partially filling the soil pore space in a highly variable and often discontinuous distribution. The volume of aquifer occupied by an LNAPL body is not comprised of a single fluid phase, but rather of multiple fluids and soil in proportions that will vary throughout. An LNAPL body is therefore a multiphase system where the pore space contains varying quantities of LNAPL, groundwater, and/or gases both above and below the static water table elevation. Generally speaking, the spatial extent occupied by an LNAPL body is predominantly comprised of water, followed by a lesser amount of LNAPL, with the smallest fraction of the pore space occupied by gas. As shown in Figure 3-2, LNAPL saturations within an LNAPL body will typically be much less than 100%. Figure 3-2. The multiphase system of a typical LNAPL body (CL:AIRE 2014). In the simplest scenario of homogeneous sandy soil and unconfined conditions, the vertical distribution of LNAPL saturation will typically occur in a pattern commonly referred to as a ‘shark fin’ – visible on a plot of LNAPL saturation percent versus depth (Figure 3-3). The most highly saturated zone will generally be within the capillary fringe, coincident with and slightly above the water table, with diminishing saturations above and below. Considering this along with Figure 3-2, LNAPL saturations are continuously variable throughout an LNAPL body in three dimensions. Note that vertical equilibrium, a basis for the green lines on Figure 3-3, is a primary modeling assumption to satisfy the founding hydrostatic pressure equations. Figure 3-3. LNAPL saturation near the water table showing observed LNAPL saturation (a. red triangles; b. black dots) compared to vertical equilibrium model simulation predictions (green lines). The observed in-well LNAPL thickness is shown for: a) homogeneous soil (Beckett and Lundegard 1997); b) a heterogeneous case with finer grained layers (2, 3 and 6) and coarser grained layers (1, 4 and 5) (Huntley, Hawk, and Corley 1994) (Huntley, Wallace, and Hawk 1994). On the pore-scale, LNAPL coexists with water and gases in different ways depending on where the LNAPL is located. LNAPL that occurs in the unsaturated zone will typically behave as a wetting phase with soil moisture. LNAPL becomes the non-wetting phase as moisture content increases toward the capillary fringe into the saturated zone (where water will be the wetting phase). This pore-scale distribution is illustrated in Figure 3-4. Unsaturated zone (Block 1) – LNAPL as a continuous intermediate wetting phase. In the unsaturated zone of porous media, soil gas forms a continuous non-wetting phase, water is present as a continuous wetting phase on the solid media, and LNAPL is present as an intermediate wetting phase (Sale, Mahler, and Smith 2016). LNAPL in the unsaturated zone forms a film between the water (on the soil particles) and gas (in large pores). Volatile LNAPL constituents in the vadose zone partition directly into soil gas and soluble LNAPL constituents in the vadose zone partition directly into pore water surrounding soil particles. Saturated zone (Block 2) – LNAPL as continuous non-wetting phase. In the saturated zone of porous media, gases are only present as a discontinuous non-wetting phase. A primary source of discontinuous gases is biologically-mediated degradation of LNAPL constituents (Amos et al. 2005). LNAPL is present as a continuous phase that is potentially mobile. Furthermore, following (Skinner and Sale 2013), depletion of LNAPL in the vadose zone via soil vapor extraction (SVE) or natural losses can draw continuous LNAPL in the saturated zone into the vadose zone via capillary processes (wicking). Saturated Zone (Block 3) – LNAPL as a discontinuous non-wetting phase. Lastly, LNAPL can occur as a discontinuous phase in the saturated zone. Absent a continuous path, discontinuous LNAPL is immobile. The primary process that depletes discontinuous LNAPL in the saturated zones is dissolution into the aqueous phase, followed by degradation via biologically-mediated processes, if geochemical conditions are ideal for degradation. Figure 3-4. Pore-scale LNAPL distribution (Hawkins 2012). As with any fluid, LNAPL will take the path of least resistance in the subsurface, with preferential pathways (both natural and man-made) often controlling the ultimate LNAPL body geometry. Similarly, LNAPL is typically the non-wetting or intermediate wetting phase and will preferentially occupy larger pore spaces in the subsurface or macropores such as fractures in clays or bedrock. As a result, LNAPL may be found in all directions from a release point (i.e., not just downgradient) in highly irregular distributions. Conceptual distributions of LNAPL in different geologic settings are provided by Contaminated Land: Applications in Real Environments (CL:AIRE 2014). Partitioning refers to the transfer of chemical mass from the LNAPL into other phases (gas, groundwater, and soil) adjacent to the LNAPL body. Partitioning results in LNAPL constituent presence in the vapor, dissolved, and/or adsorbed phases. Evaluation of the vapor phase is discussed in greater detail in the ITRC PVI document (ITRC 2014). Understanding constituent partitioning is important when investigating the occurrence of LNAPL, when evaluating the migration of LNAPL and its constituents, and when evaluating risk and safety concerns associated with LNAPL sites. Partitioning of petroleum constituents into other phases can result in additional risks (e.g., vapor intrusion into indoor air or migration of dissolved phase contaminants with groundwater). It is also important to account when appropriate remedial technologies are applied (e.g., soil vapor extraction [SVE] to remove vapors). Certain LNAPL remediation technologies rely upon constituent partitioning to remove mass (e.g., via a vapor phase using SVE) or to remove more volatile constituents and reduce risk (e.g., removal of benzene via air sparging). As such, a basic understanding of constituent partitioning is also important to develop and revise the conceptual site model, evaluate concerns, and select and implement a remedy. Linear sorption isotherms – relate sorbed and dissolved phase constituent concentrations. Data collected in the field (e.g., co-located LNAPL, soil, groundwater, and vapor samples) may also provide information relating to the partitioning of LNAPL constituents at a particular location. Further detail relating to chemical partitioning of LNAPL can be found in the ITRC TPH Risk document (ITRC 2018). Additional detail specifically with respect to partitioning within the vapor phase can be found in the January 2007 ITRC Vapor Intrusion Pathway: Investigative Approaches for Typical Scenarios (ITRC 2007). One key phase partitioning relationship is LNAPL and groundwater. The dissolved concentration of an LNAPL constituent in groundwater, according to Raoult’s Law, is the product of its concentration in the LNAPL (mole fraction) and the aqueous solubility of the pure constituent; it is not based on the saturation of LNAPL in the pore space. For example, if benzene is present in gasoline at 0.5% by weight (0.6 mole %), it’s effective solubility (equilibrium groundwater concentration) is approximately 11 milligrams per liter (mg/L) (Scenario A, Figure 3-5). If the benzene concentration in gasoline is reduced to 0.25% by weight without any measurable reduction in LNAPL saturation (e.g., using SVE), the corresponding effective solubility would also be halved to about 5.5 mg/L (Scenario C, Figure 3-5). On the other hand, if the LNAPL saturation were halved with no change in LNAPL composition (e.g., by hydraulic recovery of LNAPL), the dissolved benzene concentration in groundwater would not change. In this case, however, the longevity of groundwater impacts (Scenario B, Figure 3-5) would decrease, as the total mass of benzene would be halved. Similar relationships exist for other constituents in different pairs of phases―for example, LNAPL and soil gas (vapor pressure and mole fraction), groundwater and soil gas (Henry’s Law). In summary, the composition of LNAPL and not its mass (or saturation level) is the primary control for concentrations in adjacent phases (groundwater and soil gas). It therefore follows that the effects of chemical weathering of LNAPL in the subsurface can have a significant effect on concentrations in adjacent phases. Figure 3-5. Comparison of LNAPL mass or saturation (So) reduction (A to B) and LNAPL composition reduction in constituent concentration in LNAPL (A to C) on dissolved phase benzene concentrations in groundwater (Courtesy of S. Garg, Shell 2009). Once a release has terminated and the LNAPL body has initially stabilized, longer-term changes in the LNAPL body will be dominated by NSZD processes (including dissolution, volatilization, and biodegradation) and smearing due to water table fluctuations. NSZD processes progressively reduce LNAPL mass over time via direct biodegradation of LNAPL by microbes and by physical partitioning processes, into other phases (e.g., soil gas and groundwater), where biodegradation also occurs. This results in the depletion of constituents from the LNAPL and reduction in mass, and eventually, diminishing amounts of constituent dissolution and volatilization. NSZD processes therefore play an important role in risk mitigation and the long-term stability of LNAPL bodies (Mahler, Sale, and Lyverse 2012). NSZD processes are discussed in more detail later in this section and in the NSZD Appendix. The smearing of LNAPL due to water table fluctuations will redistribute the LNAPL mass so that it becomes progressively less mobile and recoverable over time. For example, in a rising and subsequent falling water table in an unconfined condition: the mobile fraction of the LNAPL will move up with the water table during the rise (Figure 3-6), but some portion of this mobile fraction will become trapped in the pore space when the water table drops. Therefore, the vertical LNAPL distribution changes and the mobile fraction that remains afterwards are smaller. Seasonal fluctuations in the water table that redistribute the mobile LNAPL fraction, together with biodegradation, dissolution, and volatilization that deplete LNAPL mass, decrease the fraction of mobile LNAPL over time until all LNAPL exists as residual. Figure 3-6. Conceptual depiction of LNAPL observed within the formation and within monitoring wells (a – e) during a variable water table and LNAPL thickness shown on the bottom graph (after (ITRC 2009a); (CL:AIRE 2014)). Sn is saturation of the pore space of NAPL, and Sw is saturation of water. As described in Section 3.2, concentrations of dissolved and vapor phase constituents may gradually decline, but will typically decrease by less than an order of magnitude. Risks associated with phase changes (e.g., vapor phase, dissolved phase) are discussed further in Section 5 and Section 6. Specific factors affecting the mobility of the LNAPL such as soil type and saturation levels are discussed later in this section. Typically, LNAPL will remain the non-wetting (saturated zone) or intermediate wetting (unsaturated zone) fluid. These sites exhibited high fractions of silt and clay content and weathered diesel. LNAPL NSZD encompasses a variety of processes that act to biologically degrade and physically redistribute LNAPL constituents to the aqueous or gaseous phases where they are also subsequently broken down biologically (ITRC 2009a). NSZD occurs primarily through direct contact oil biodegradation, biodegradation of solubilized hydrocarbons at the oil/water interface, LNAPL volatilization and biodegradation in the vadose / smear zone, and less significantly through dissolution into groundwater and biodegradation in the saturated zone [(Ng et al. 2014); (Ng et al. 2015); (Johnson, Lundegard, and Liu 2006); and (Molins et al. 2010)]. NSZD begins as soon as LNAPL is released to the subsurface, typically via volatilization and dissolution, and eventually most prominently through biodegradation as intrinsic microorganisms acclimate to the presence of the petroleum hydrocarbons and use it as a growth substrate. Direct-contact biodegradation occurs in the immediate proximity to the LNAPL, within pores with oil where air-phase porosity is present (e.g., top of LNAPL body). By-product gases from this reaction are directly outgassed to the vadose zone and do not enter aqueous phase. At the Bemidji crude oil research site, greater than 80% of the observed carbon efflux was attributed to direct-contact biodegradation and outgassing (Ng et al. 2015). Biodegradation of LNAPL constituents occurs across the entire smear zone (from unsaturated, to partially, to fully saturated) by naturally-occurring microorganisms. Biodegradation occurs via a multitude of mechanisms in both aerobic and anaerobic conditions. Aerobic biodegradation occurs where ample oxygen (O2) is present. In a relatively short time (i.e., several months depending upon geochemistry), the often finite supply of electron acceptors within the LNAPL smear zone such as O2, nitrate (NO3–), ferric iron (Fe3+), and sulfate (SO42-) are consumed and conditions become increasingly more favorable to anaerobic biodegrading organisms that produce methane (CH4). Gaseous by-products of biodegradation processes, carbon dioxide (CO2) and CH4, are observable in the vadose zone soil gas above the LNAPL source zone. As the CH4 diffuses upward, it encounters O2 diffusing downward from the atmosphere which enables intrinsic methanotrophs and other microorganisms to consume the CH4 and create CO2 and water vapor. Vapor phase hydrocarbons (i.e., volatile organic compounds [VOCs]) are also degraded aerobically and anaerobically in the vadose zone, depending on the local (pore scale) conditions. CO2 efflux, measurable at ground surface, provides evidence of these biodegradation processes. In the saturated zone, dissolution losses are observed as dissolved phased hydrocarbons in analyzed groundwater samples collected from monitoring wells immediately adjacent to and downgradient from the LNAPL source. The effects of biodegradation of dissolved hydrocarbons can be observed in dissolved groundwater plumes by measuring changes in geochemical parameters: decreases in dissolved O2, NO3–, and SO42- and increases in dissolved ferrous iron (Fe2+), manganese (Mn+2), CO2, and CH4 (NRC 2000). NSZD processes are observable at all LNAPL release sites. The rate that NSZD reduces the LNAPL mass (i.e., the bulk NSZD rate) can be estimated by measuring CO2 efflux rates at the ground surface, CO2 or O2 gradients in vertically nested soil gas monitoring systems, and from temperature gradients measured with vertical thermocouple arrays placed in the ground (API 2017). The NSZD rates of individual compounds of interest (e.g., BTEX) are difficult to estimate with these approaches at this time, but can be assessed by observing the chemical changes in LNAPL composition over time. NSZD rates at a given site are affected by a number of interrelated factors including: temperature, soil moisture, soil gas permeability, groundwater geochemistry, and microbiology. To date, most measurements have provided NSZD rates in a relatively narrow range. An analysis of rate information from 25 sites revealed the middle 50% of sites exhibited NSZD rates between 700 and 2,800 gallons/acre/year, with a median of approximately 1,700 gallons/acre/year (Garg et al. 2017). The NSZD Appendix contains a more detailed discussion of NSZD processes. Historically, thickness of LNAPL in a well was used to provide unit volume estimates of LNAPL, the mobile LNAPL interval, and as an indicator for the magnitude of recoverability. Today, it is better understood that higher resolution tools, such as LIF, provide a better resolution of LNAPL location, and in situ distribution and transmissivity provide a better indication of recoverability. The apparent LNAPL thickness in a well relates to the hydrogeologic conditions and characteristics of the LNAPL and soil. Water table fluctuations can lead to the misconception that the LNAPL body is not stable. Water table fluctuations, due to seasonality or tidal fluctuations, influence the occurrence of LNAPL in the aquifer and wells [(ITRC 2009b); (Kemblowski and Chiang 1990)]. However, the changes in measurable thicknesses in a monitoring well are a result of changes in the vertical re-distribution of LNAPL saturation and do not typically indicate a change in the lateral extent of the LNAPL body. The apparent thickness in the well is commonly exaggerated compared to the thickness of the mobile LNAPL interval in the formation as discussed below for unconfined, confined, perched, and fractured bedrock settings (Marinelli and Durnford 1996). For the reasons described below, assess the site-specific hydrogeologic conditions to interpret the data properly before using in-well LNAPL thickness in the LCSM. Under unconfined conditions, LNAPL thickness in a monitoring well may increase as the water table falls and LNAPL flows into the well. 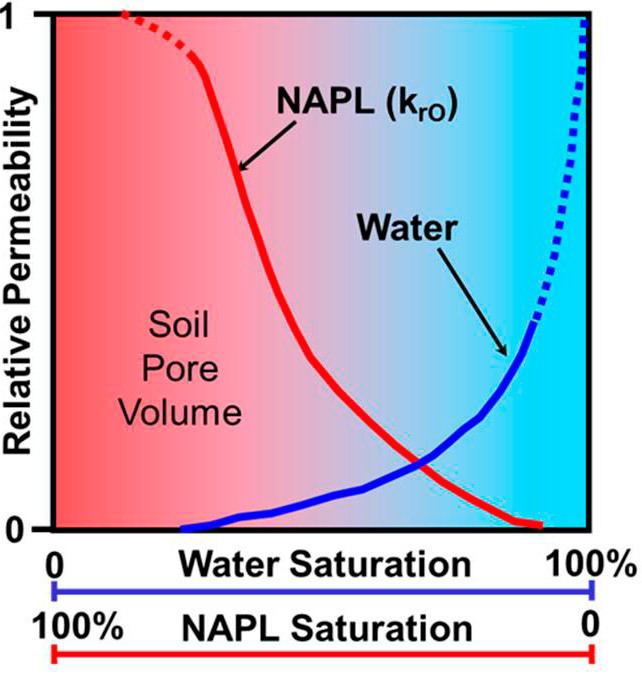 As the water table rises, LNAPL becomes entrapped in the saturated soil and the apparent LNAPL thickness in the well decreases. When unconfined conditions are at equilibrium, the apparent LNAPL thickness in the well will closely match the equilibrium thickness of the mobile LNAPL interval intercepted by the well. Under confined conditions, LNAPL thickness in a monitoring well typically increases as the potentiometric surface rises and decreases as the potentiometric surface falls. Often, the LNAPL thickness observed in the well may be exaggerated compared to the thickness of the mobile LNAPL interval within the formation. Confined LNAPL is trapped in an aquifer beneath a layer that limits the upward movement of the LNAPL. The term ‘confined LNAPL’ is used because the mobile LNAPL is under pressure against the underside of a capillary confining layer (often fine-grained, lower permeability lithology). The LNAPL is under pressure within this zone, and a monitoring or recovery well screened across a mobile confined LNAPL interval acts as a “pressure release valve.” After installation, the LNAPL enters the well screen and rises in the well to equalize with atmospheric pressure. LNAPL accumulates as an exaggerated in-well LNAPL thickness (see Fractured Rock Appendix). Monitoring the in-well LNAPL thickness response to water table (potentiometric) elevation changes is one way to assess whether LNAPL is confined. For confined LNAPL, the variability of the water table elevation with in-well LNAPL thickness will be the opposite of that described for the unconfined condition. For confined systems, the in-well LNAPL thickness will increase with an increase in potentiometric surface elevation, as shown in Figure 3-7. For a given site, both unconfined and confined LNAPL may exist. Further, a given location or well may be initially unconfined but may become confined through a rise in elevation of the water table. Additional, more specific information relating to changes in LNAPL thickness in confined conditions is available in (Kirkman 2013) and (ANSR 2012). Figure 3-7. LNAPL thickness will mimic the potentiometric surface elevation for confined LNAPL conditions (courtesy of BP). Under perched conditions, LNAPL thickness in a monitoring well may be exaggerated compared to the adjacent mobile LNAPL interval. If the well extends into the underlying confining layer, LNAPL will flow into the “sump” or reservoir created by drilling into the underlying confining layer. LNAPL may be perched due to the pooling of LNAPL on top of a lower permeability feature within the unsaturated zone, or at the interface of the overburden and bedrock. Perched LNAPL is mobile LNAPL that accumulates in the vadose zone above less permeable layers, which exhibit a pore entry pressure greater than the available LNAPL head, and thus impedes the downward migration of LNAPL. If a sufficient volume of LNAPL collects above a less permeable (perching) layer, the resulting LNAPL thickness within a monitoring well screened into the perched LNAPL layer and into the underlying lower-permeability formation will result in a measured thickness that is greater than that in the surrounding formation. This condition results, in part, because the portion of the well screened below the interface and into the less permeable perching layer acts as a sump and allows LNAPL to accumulate. When the water table on the perched layer rises, the thickness of LNAPL in a well screened across the perching layer will decrease and again, will not be representative of the actual thickness of LNAPL within the formation at that location. areas where the geology is known to have preferential pathways such as fractured clay and bedrock, or may have macropores or other secondary porosity features. This section discusses the details of LNAPL occurrence in soil and how it relates to migrating, stable mobile, and residual LNAPL conditions. The terms migrating, mobile, and residual LNAPL saturation relate to LNAPL concerns, remedial technologies, and remedial metrics. This section explains the terminology and applies the understanding to LNAPL site management. For sites where LNAPL is not observed in-well, it also provides a summary of indicators in soil and groundwater that can be used to assess its presence. Figure 3-8 illustrates the evolution of an LNAPL release. At the early stage of the release, the LNAPL head from the release develops a strong LNAPL gradient shown in the top figure; as the LNAPL continues to drain from the release—lowering the LNAPL head—the gradient dissipates and with time will mimic the water table gradient. The upper pane illustrates a situation before the LNAPL release is stopped. The LNAPL body is migrating due to the LNAPL head. LNAPL will continue to migrate laterally until the release is stopped and the LNAPL head dissipates. The middle pane illustrates a situation where the LNAPL release has been stopped and the LNAPL head had dissipated. LNAPL accumulates in a well installed in the LNAPL body, but the LNAPL is no longer migrating (spreading) laterally. The lower pane illustrates the situation where LNAPL is at residual saturation. LNAPL will not accumulate in a well installed in the LNAPL body unless the water table drops and LNAPL trapped below the water table can flow into the well. Figure 3-8. Three LNAPL conditions (ITRC 2009a). LNAPL migration and mobility concerns have risk and non-risk implications at many LNAPL sites. It is important to understand the distinction between migrating LNAPL, mobile LNAPL, and residual LNAPL to establish appropriate remedial goals and determine remediation objectives. For each of these three conditions, physical properties of the LNAPL, aquifer properties, LNAPL saturation (including LNAPL relative permeability), LNAPL hydraulic conditions (e.g., LNAPL head) and NSZD affect the ability of an LNAPL body to expand or for LNAPL to flow into a well. Section 5 of this document describes the decision process for identifying LNAPL concerns, verifying concerns through the application of threshold metrics, establishing LNAPL remedial goals, and determining LNAPL remediation objectives. An understanding of whether the LNAPL at your site is residual, mobile, or migrating is key to evaluating concerns, establishing remedial goals, and determining remediation objectives. Migrating LNAPL refers to plume-scale behavior; the overall body or a portion of the LNAPL body is expanding. The mechanisms that drive LNAPL migration are sufficient to overcome resistive forces. Conversely, stable LNAPL represents an LNAPL body that does not change over time and does not contain the driving forces to exceed the resistive forces. A stable LNAPL body is comprised of residual LNAPL or a combination of mobile and residual LNAPL. LNAPL transmissivity is an indicator of the potential for migration, but by itself is insufficient to indicate the rate of migration. Assuming there are no resistive mechanisms, the rate of migration (or equivalently, the rate of LNAPL specific discharge) would be represented by LNAPL transmissivity times the LNAPL gradient. However, resistive mechanisms exist that render this calculation an overestimate of migration. These resistive mechanisms include water-table fluctuations, entry pressure head, and mass depletion via natural mechanisms (i.e., NSZD). Therefore, while mobile LNAPL and an LNAPL gradient may exist, migration may or may not occur because the resistive mechanisms may reduce the magnitude of migration, or counteract it completely. LNAPL migration concern within an aquifer refers to lateral movement of the overall LNAPL body, whereby LNAPL enters aquifer pore spaces not previously containing LNAPL. This can occur only if the LNAPL possesses sufficient mobility potential (i.e., within the mobile range of LNAPL saturations) and sufficient LNAPL head (and capillary pressure) to drive the migration. Consequently, active LNAPL migration refers to spreading that occurs along the leading edge of the LNAPL body, where the LNAPL pressure head or driving force exceeds the capillary entry pressure (the resisting force) for the adjacent groundwater saturated aquifer. LNAPL migration tends to occur over the relatively early stages of a release, when the LNAPL head pressures and LNAPL saturations are greatest, except in the case of a change in hydraulic conditions (e.g., pumping on a nearby well). Following the termination of an active release, the LNAPL pressure head may decrease rapidly, which ultimately limits the overall volume of LNAPL available to migrate laterally. Afterwards, LNAPL typically is limited to vertical redistribution within the smear zone as new historical high or low water levels are attained. It is not necessary that the margin of the LNAPL body be at residual LNAPL saturation; equilibrium is typically established with the mobile (albeit diminished) LNAPL saturation still remaining. The water-filled pore spaces of the fully saturated aquifer simply act as a barrier to further LNAPL migration as capillary pressure decreases. Post release, as the plume spreads, the gradient decreases and the thickness decreases, which in turn decreases the transmissivity of the LNAPL, resulting in a self-limiting process. Note that natural or manmade preferential pathways may exist at a given site that could allow migration to occur where it would not otherwise be expected. In such cases, the capillary entry pressure associated with the preferential pathway is less likely than that of the overall aquifer given the same LNAPL head pressure. Care must be taken when using LNAPL thickness data from monitoring wells to assess LNAPL migration. Vertical re-distribution of LNAPL with a rising or falling water table can result in the appearance of an increased (i.e., growing) or decreased (i.e., shrinking) footprint, or apparent lateral migration of LNAPL that is not representative of actual conditions. LNAPL that “disappears” from a well may not be related to LNAPL migration, but rather to drainage. Likewise, increasing LNAPL thickness or appearance within a well is not necessarily a sign of increased or renewed migration. Rather, LNAPL thickness within a well is continually affected by drainage and imbibition effects within the near well bore formation and sand pack environment as water levels change. 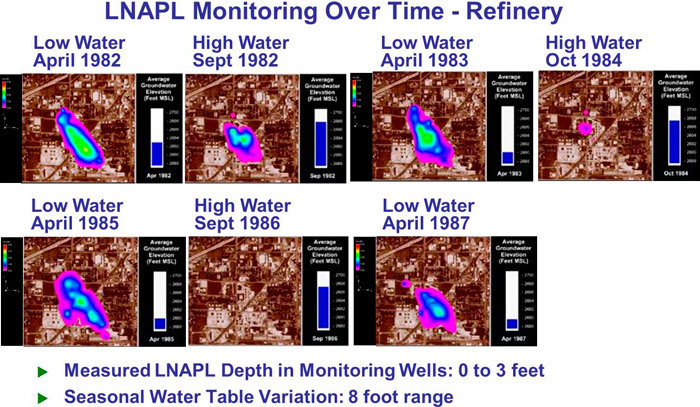 Figure 3-9 shows the apparent horizontal redistribution of LNAPL at a refinery over time resulting from vertical changes in LNAPL distribution. In actuality, there was very little change in horizontal or lateral footprint over the five-year duration depicted. Figure 3-9. Examples of seasonal LNAPL redistribution (API 2006). Multiple lines of evidence are recommended to fully assess the LNAPL migration for relatively recent releases (e.g., well gauging and dissolved phase plume behavior). LIF-based borings are a more technically sound means to define the leading edge of LNAPL accumulations, particularly in the early phases of an investigation. For late-stage release sites, it is often acceptable to assume lateral migration is at equilibrium, for the reasons discussed previously. Diagnostic gauge plots are a useful tool for evaluating whether or not the gauged thickness of LNAPL in a well is indicative of migration or rather more likely, the result of water table fluctuations. Migration is also limited by NSZD processes (volatilization, dissolution, and biodegradation) resulting in mass loss and increased LNAPL viscosity (Mahler, Sale, and Lyverse 2012). NSZD losses can act to offset/balance the spreading effects caused by any local LNAPL pressure heads (Mahler, Sale, and Lyverse 2012). This is a dynamic relationship. When saturations are high, LNAPL mobility can cause LNAPL to migrate laterally toward the periphery of the body, while depletion processes act to remove LNAPL mass and diminish saturations, thereby balancing the movement. NSZD processes are discussed further in the NSZD Appendix of this document. Driving forces of a LNAPL release will penetrate below the water table. 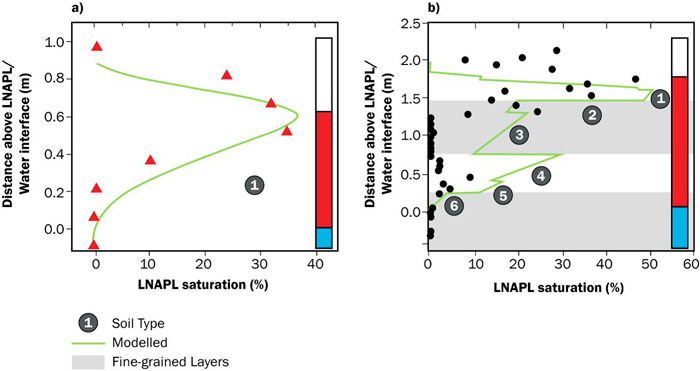 The LNAPL head gradient (i.e., the height of the LNAPL release above the water table) resulting from the LNAPL release principally determines the lateral spread of LNAPL near the water table, within the capillary fringe. Immediately following a release of sufficient volume, the LNAPL head is initially greater than the water table gradient. The LNAPL gradient will dissipate with time, eventually leading to LNAPL footprint stabilization (Figure 3-8). Stabilization depends on the type of LNAPL and the volume of the release. Commonly, low viscosity LNAPL (e.g., gasoline and diesel) takes weeks to months to stabilize, and high viscosity LNAPL (e.g., heating oil) requires months to years to eventually stabilize (CL:AIRE 2014). For distinct LNAPL releases, the LNAPL will eventually become stable and form a source of varying saturation levels within the pores of the formation. The LNAPL saturation at the leading edge will drop in saturation to below residual (i.e., fraction of the pore space occupied by LNAPL that cannot be mobilized under an applied gradient), and through balances of factors at the leading edge, will cease to migrate due to insufficient LNAPL head to exceed pore entry pressure, lower LNAPL saturations (i.e., residual), and NSZD processes (Tomlinson et al. 2017). Residual LNAPL is unlikely to become a problem if hydraulic conditions change, but mobile LNAPL may move with changes in hydraulic conditions (e.g., operation of a pumping well). Mobile LNAPL represents a pore-scale concept. LNAPL occupies a sufficient fraction of the total porosity to form an interconnected network, but does not contain the driving forces on the LNAPL body to exceed the resistive forces. Mobile LNAPL can be detected via in-well fluid level gauging or through LNAPL transmissivity measurements. If an in-well thickness is measurable, then mobile LNAPL exists. The relative magnitude of LNAPL mobility can be assessed using LNAPL transmissivity. Mobility refers to the ability of LNAPL to move or flow, vertically or horizontally, under a given gradient. LNAPL migration is the expansion of the LNAPL body footprint resulting from sufficient mobility and gradient, thus resulting in the expansion of the overall LNAPL body edge. LNAPL that accumulates in a well is considered mobile; however, its presence in a well is not a reliable indicator of potential recoverability nor the LNAPL body’s migration potential. The degree of mobility is dependent on both the proportion of movable LNAPL in the pore spaces (i.e., mobile LNAPL saturation) and the degree of interconnection between pore spaces (Figure 3-10). Residual LNAPL is not mobile. The proportion of the overall LNAPL body—associated with its residual LNAPL saturation—does not participate in its mobility (i.e., immobile fraction). Figure 3-10. LNAPL mobility is the additional consideration due to exceeding residual saturation (courtesy of S. Garg 2017). Residual LNAPL represents a pore-scale concept whereby LNAPL occupies a fraction of pore space that is discontinuous and too small for LNAPL flow to occur. Residual LNAPL has an insignificant transmissivity. As discussed above, residual spans a range of LNAPL saturation levels for a given soil and LNAPL type. An additional and significant factor for determining the residual saturation of a given soil is the maximum historical saturation [(Johnston and Adamski 2005); (Lenhard, Rayner, and Davis 2017)]. Often the minimum and maximum historical saturation levels span a factor of 10 across a given LNAPL body. Accepting residual saturation as a function of maximum saturation and applying it at plume scale can be useful to explain why quantifying residual saturation as a single value is not consistent with the current conceptual model of LNAPL occurrence and migration. The LNAPL head is greatest when a release occurs and LNAPL reaches the water table, resulting in the highest LNAPL saturations. After the release ceases and the LNAPL spreads out, LNAPL on the edges of the body is exposed to lower LNAPL heads resulting in lower LNAPL saturations. Thus, residual saturation is often higher in the center of the body than on the fringes. Similarly, the maximum historical LNAPL saturation will vary with depth at each location within the LNAPL footprint, resulting in vertically variable residual saturations. Water table fluctuations can help to reduce variability in residual saturation at some locations; however, variability still exists. When considering site management options, determining whether LNAPL is mobile or residual is insufficient to identify the primary concerns (See Section 5). Most LNAPL concerns are driven by the migration of the LNAPL body, compositional risks, and abating LNAPL occurrence in wells to the maximum extent practicable. Migration can be evaluated using multiple lines of evidence. If an LNAPL body is stable, then hydraulic recovery will have little impact on future management. Continued recovery will not reduce compositional-based risk, meaningfully reduce the source mass, nor significantly reduce source longevity. Conversely, if an LNAPL body is mobile, thus containing higher LNAPL transmissivity values, then hydraulic recovery may be beneficial to reduce LNAPL body mass. The efficacy of recovery indicated by LNAPL transmissivity is ultimately controlled by the ratio of residual to mobile LNAPL. High LNAPL transmissivity values with relatively thick smear zones will result in larger fractional source removal than thick residual smear zones exhibiting a similar LNAPL transmissivity value. Residual saturation is discontinuous and immobile LNAPL under prevailing conditions and will not flow into a well (ASTM 2014b). The residual saturation within the unsaturated zone is the LNAPL saturation attained after an initially saturated soil is allowed to drain by gravity to equilibrium [(Hoag and Marley 1986); (Zytner, Biswas, and Bewtra 1993)], which is analogous to field moisture capacity as used in the agricultural engineering field. The residual LNAPL saturation in the saturated zone has been defined as the saturation at zero capillary pressure at the terminus of the spontaneous imbibition curve [(Pickell, Swanson, and Hickman 1966); (Bear 1972); (Dullien 1979); (Fetter Jr. 1992); and (Freeze and McWhorter 1997)]. Generally, the residual saturation will be lower within the unsaturated zone compared to the saturated zone. The unsaturated zone contains a more significant gas-filled porosity. Thus, the LNAPL becomes an intermediate wetting fluid which allows more of the fluid to drain from the soil as compared to the saturated zone where the gas phase is small and LNAPL is the non-wetting fluid. It is notable that many literature values (particularly those developed based on petroleum exploration) of residual saturation typically overestimate residual saturation as they are frequently based on experimental data collected using sand or dry soils. This tends to result in a low threshold entry pressure and a higher initial LNAPL saturation resulting in a higher residual saturation. In all but well sorted sands, literature values of residual saturation are likely not applicable (becoming more so as soils get finer). Although some of the early references (e.g., (Mercer and Cohen 1990); (EPA 1995)) were based on state of the art science, our current understanding indicates that sites do not reach initial saturations of 100% at environmental sites. The user of literature values needs to understand their limitations. Residual saturation is a fraction of the total saturation and is proportional to the maximum LNAPL saturation occurring in a given soil. 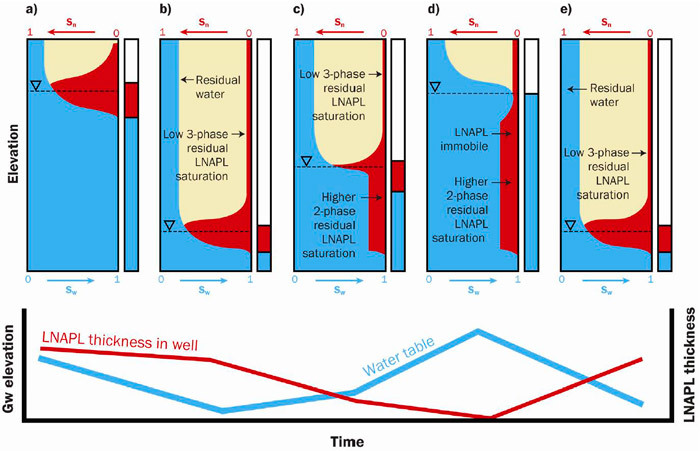 As soil is successively flooded with and drained of LNAPL, such as occurs with repeated water table fluctuations as shown in Figure 3-6, the residual saturation tends to increase. Residual saturation is also inversely related to the grain size; it is typically larger in finer-grained soils. Prior guidance attempted to define remediation endpoints based on residual saturation. However, the current state of the science supports that residual saturation is a conceptual limit; residual saturation cannot be easily measured and is not a value that is currently used as a remediation endpoint metric. It is recognized that the practical limits of recoverability are above the conceptual residual saturation value; this is discussed further in the Transmissivity Appendix. Typically, a laboratory analysis can be performed to estimate the residual saturation. As discussed, these are estimates of the residual saturation for the given location and depth; residual saturation varies across any given site and typically, cannot be defined as a single number. To bind this range of variability, collect soil samples across a given boring and compare them to the mobile LNAPL interval. The samples outside of the mobile LNAPL interval represent residual LNAPL values. At petroleum release sites where an LNAPL concern exists, but it has not been directly observed, a determination of LNAPL presence should rely on multiple lines of evidence to verify or eliminate the suspected LNAPL concern. Monitoring for the presence or absence of LNAPL in monitoring wells can be helpful; however, it should not be the only assessment tool. Where LNAPL is present in a properly constructed monitoring well, LNAPL can also be assumed present in the surrounding subsurface formation. However, it is a common misconception to assume that if no LNAPL is present in a monitoring well, then there is no LNAPL in the soil. Similarly, if in-well LNAPL thickness changes from measurable to not measurable following LNAPL remediation, it is a common misconception to assume that LNAPL is no longer present within the surrounding subsurface soil. In both of these scenarios, LNAPL may be present in discontinuous pores at saturations less than those needed to migrate laterally or to mobilize into a monitoring well. Table 3-2 lists potential indicators of the presence of LNAPL in unconsolidated materials, and more importantly, also cautions the use of indicators that should be viewed as ‘lines of evidence’ rather than absolute indicators. Note also that Table 3-2 does not cover all situations (e.g., sediments nor fractured media). The use of soil or groundwater concentrations to assess whether LNAPL is present should be regarded as supporting evidence and not as absolute indicators. There is not a specific concentration in groundwater that indicates the presence of LNAPL, because varying product compositions and degrees of weathering affect concentrations of dissolved components. Similarly, the use of TPH concentrations in soil as an indicator of LNAPL presence should be exercised with caution as soil TPH concentrations may be affected by non-hydrocarbons (such as soil organic matter) and by the choice of analytical method. However, the closer a measured concentration in groundwater is to the effective solubility, the greater the likelihood that LNAPL is present. For more information, reference the ITRC TPH Risk Document (ITRC 2018). A comparison of historic and current site-specific dissolved and vapor phase concentrations, and boring logs with notes about locations and depths of impacted soils, can provide additional lines of evidence pertaining to the presence or absence of an LNAPL body. For example, significant lateral migration and an increase in dissolved-phase concentrations, or the sudden appearance of vapor in buildings, may suggest that LNAPL is present. Visual observations of the soil core combined with field screening tools such as a photoionization detector (PID) or flame ionization detector (FID) with CH4 correction, or use of LIF tools as the boring is advanced, can confirm the presence or absence of LNAPL in the borings. Care should be taken to design a soil investigation that assesses the areas with the greatest potential for LNAPL. Inadequate distribution or placement of soil borings can lead to an incomplete investigation and the presumption of no LNAPL presence when it may indeed be present in the subsurface. There is not a specific petroleum hydrocarbon compound (PHC) concentration in groundwater that defines LNAPL because of varying product types and degrees of weathering. The use of TPH soil concentration data as LNAPL indicators should be exercised with caution. Note that the information in this table may not be applicable to media such as sediment or fractured media. TPH soil concentrations can be affected by the presence of soil organic matter. TPH soil concentrations are not well correlated with TPH or O2 soil gas concentrations (Lahvis and Hers 2013). Organic vapor readings are composition dependent. For older (weathered) releases, LNAPL may be present at much lower PID/FID readings. The probability of encountering LNAPL increases closer to a known or suspected release. Notes: Order of listing does not imply ranking. Indicators above are generalized and do not represent all possible situations. 1 One or more of these indicators may be used to define LNAPL. 2 Used in the derivation of PVI screening distances by (EPA 2013) and (Lahvis et al. 2013). 3 Used in the derivation of PVI screening distances by (Peargin and Kolhatkar 2011). 4 Used in the derivation of PVI screening distances by (EPA 2013). 5 Recommended by (Lahvis and Hers 2013). 6 From ITRC TPH Risk Document (ITRC 2018). 7 From ASTM E2531-06 (ASTM 2014b). 8 Recommended by (EPA 2013) and (Lahvis and Hers 2013). This section discusses the relation between mobile LNAPL and recoverability and introduces the key concept of LNAPL transmissivity. LNAPL recoverability refers to the ability to remove mobile LNAPL from the subsurface at a given location, as evaluated by comparing the measured LNAPL transmissivity to an agreed upon threshold. Understanding LNAPL recoverability is important, particularly for sites where one or more remediation endpoints are based on removal of LNAPL (e.g., to the maximum extent practicable). Although this discussion focuses on LNAPL recoverability under ambient site conditions, additional remedial technologies that rely on increasing the recoverability of LNAPL (e.g., water flooding, surfactant-enhanced remediation, and co-solvent flushing) are discussed in Section 6 of this document. Reaching a recoverability limit does not necessarily mean that LNAPL saturations are reduced to residual, but it does typically represent an endpoint where the majority of remaining LNAPL is of limited mobility and/or residual. It may continue to accumulate in a monitoring well, for example. 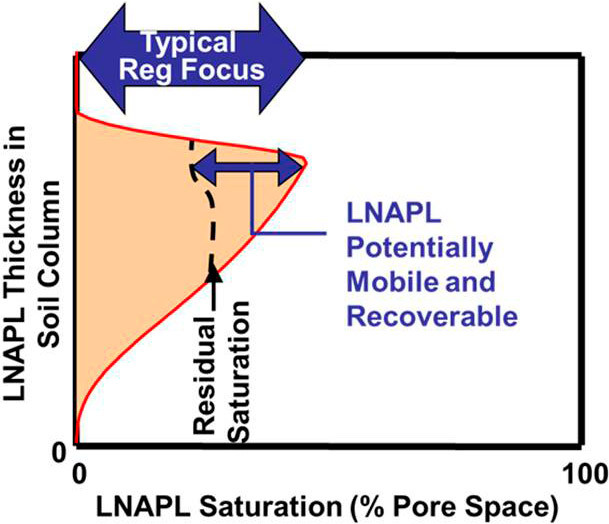 A critical factor in LNAPL recoverability is the decrease in LNAPL relative permeability over the operating time of the remediation technology. 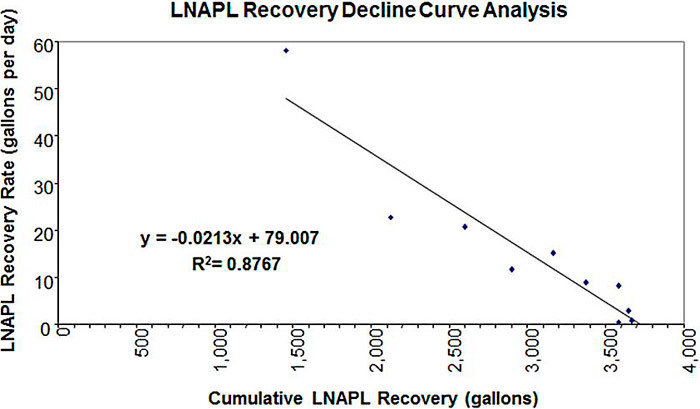 As removal progresses over time, LNAPL saturations are reduced, which causes the relative permeability of LNAPL to decrease (red line on Figure 3-11), and also results in declining recovery rates. Figure 3-11. LNAPL relative permeability. recovery no longer reduces the source to the extent that conditions with respect to risk-based dissolved phase and/or vapor phase goals improve. Practical limits can also be prepared in terms of economic return (e.g., cost per gallon) of LNAPL recovery, including the lifting and treatment cost of the produced groundwater), and/or physical restraints (e.g., gallon of LNAPL recovery/unit of time relative to the overall volume of in-place LNAPL, including the residual volumes or reduced LNAPL transmissivity values as recovery progresses). Again, some mobile LNAPL will remain after hydraulic recovery has ceased (in addition to the immobile, [residual] fraction of LNAPL that is unrecoverable due to inherent extraction inefficiencies). LNAPL transmissivity is analogous to groundwater transmissivity; higher transmissivity values indicate higher production rates for a given drawdown induced. However, groundwater is typically expansive, and recharge by precipitation may sustain groundwater extraction for years at similar rates and drawdowns without exhibiting a decline in water production. In contrast, LNAPL bodies often have a limited extent of mobile LNAPL and transmissivity and recovery decline as LNAPL is removed. LNAPL recovery is often termed “asymptotic” because the rate keeps decreasing, but never reaches zero. Decline curves have been used to illustrate this for optimized recovery systems with robust data sets. Figure 3-12 provides a chart of real site data where recovery started out at a high rate and declined over time. The data in Figure 3-12 can also be plotted as recovery rate (y-axis) versus cumulative recovered volume (x-axis) to present a decline curve (Figure 3-13). The x-intercept of a best fit line through the data shows that the ultimate recovered volume is expected to be approximately 3,700 gallons. Although LNAPL may still occur in wells, it is understood from this analysis that continued LNAPL recovery will not perform as well as it had in the past. If additional remediation is warranted, this line of evidence indicates an alternative technology may be required, as the practicable limit of hydraulic recovery has been achieved. Knowing of this practicable limit, LNAPL transmissivity can be used as a leading metric, in advance of system installation, to evaluate whether LNAPL recovery will be effective. Measurements of baseline LNAPL transmissivity, before system installation, can help provide a line of evidence to indicate if a site is already near its practicable limits for recovery. Empirical data suggests that LNAPL transmissivity values below 0.1 to 0.8 ft2/day indicate low recoverability and therefore, the majority of the LNAPL at a site is in a state of lesser mobile and residual saturation. ITRC (ITRC 2009a) proposed this empirical limit based on five sites in California, Kentucky, and Florida. The sites were closed or granted no further action after developing comprehensive LCSMs and operating LNAPL recovery systems. All sites demonstrated achievement of the impracticable limit (i.e., the lack of LNAPL recoverability) irrespective of in-well LNAPL thickness remaining. Since that time, data from four additional sites, with comprehensive LCSMs based on high-resolution data, were analyzed and affirmed the proposed limits. Refer to the LNAPL Transmissivity Appendix for additional discussion on the basis for the proposed range of recoverability limits. This section describes subsurface chemical partitioning processes and introduces the key concept of saturation- and composition-based remedial goals as they relate to technology selection. Figure 3-14 provides a graphical representation of mobile, migrating, and residual LNAPL and illustrates where compositional, hydraulic recovery, and saturation reduction technologies are applicable within the spectrum. For example, a site with migration concerns and high LNAPL transmissivity, can be addressed with LNAPL recovery, where the remediation endpoint is 0.1 to 0.8 ft2/day. However, if the remedial goal is to remove all LNAPL, then alternate technologies will be needed in addition to (or in lieu of) LNAPL recovery. 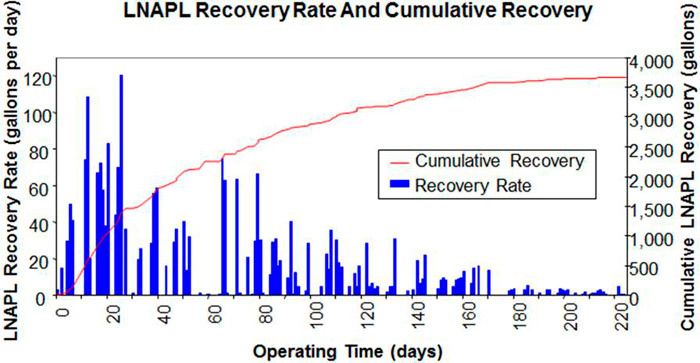 Since the practicable limits of LNAPL recovery is represented by an LNAPL transmissivity of 0.1 to 0.8 ft2/day, LNAPL recovery cannot meet a remedial goal of removing all LNAPL. Figure 3-14. Relationship between LNAPL concern, LNAPL state, technology group and recoverability. Where a compositional risk exists, consider phase-change technologies either in tandem with or in lieu of LNAPL recovery. While multi-phase extraction (MPE) would be worthwhile in a coarse sand with a dissolved phase concern and high transmissivity (e.g., mobile LNAPL) this technology may be less effective with a weathered diesel fuel and residual LNAPL. The weathered diesel fuel is unlikely to have a dissolved phase BTEX plume and will likely exhibit low or negligible LNAPL transmissivity. While excavation may target the total mass, depth limitations and cost may indicate that a bioremediation or NSZD alternative is more appropriate, as the majority of constituents within diesel are biodegradable.